Two ranked teams, one trip to California, another homecoming test … and no passports. Navy released its 2013 football schedule today, and while fans won’t have to cross the Atlantic to follow the Mids this season, they will have to hit the road to see their squad face its toughest opponents — Notre Dame (Nov. 2) and San Jose State (Nov. 23). The Irish finished fourth in the final Associated Press poll after their throttling at the hands of Alabama in the Bowl Championship Series title game. San Jose State finished the year ranked 21st with an 11-2 record and a 29-20 season-ending win over Bowling Green in the Northrop Grumman-sponsored (and Sgt. Stripes-mascoted) Military Bowl. The Mids visit Indiana to open the season (Sept. 7), with the Hoosiers attempting to avenge a loss at Navy’s homecoming last year. Navy opens at home against Football Championship Subdivision foe Delaware (Sept. 14), then hits the road two weeks later to face Western Kentucky (Sept. 28) before hosting Air Force (Oct. 5). The season’s only two-game road stretch includes swings through Duke (Oct. 12) and Toledo (Oct. 19). Homecoming comes against Pittsburgh, which will be in the middle of its first season with the Atlantic Coast Conference (Oct. 26). After the aforementioned trip to South Bend, the Mids return home for back-to-back games with Hawaii (Nov. 9) and South Alabama (Nov. 16), then head to San Jose. 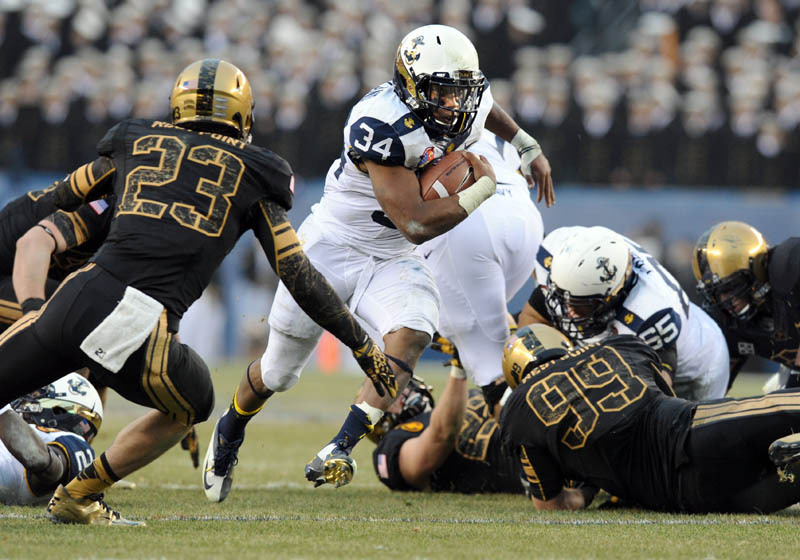 Just like last year, the 2013 regular-season wraps up with a showdown against Army in Philadelphia (Dec. 14). Any of that sound familiar? It should — it mirrors the tentative 2013 schedule released two years ago. If Navy manages six wins, it’ll earn a spot in the Bell Helicopter Armed Forces Bowl, set for a December date to be determined in Fort Worth, Texas.